Even if you manage to keep junk food away from your kids, and regularly get them to eat veggies, they would likely benefit from taking a few vitamins. Supplements fill in the gaps and fine-tune even the healthiest diets. Perfection isn’t possible, but top supplements can support calm immunity and overall good health. Here are four that you can consider giving to your kids. Low levels of magnesium, also known as the calming mineral, are associated with anxiety and irritability. But magnesium is also needed for kids to move, breathe, think, sleep, walk, run, dance, see, hear, and so much more. Magnesium also helps to deliver calcium to the bones, and is often much harder for kids to get from their diets than calcium. 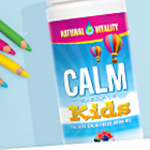 Calm Specifics Kids is formulated just for kids, featuring multi-award-winning Natural Vitality’s Calm magnesium, plus Suntheanine, a patented, premium form of the relaxing amino acid L-theanine, and choline to help support brain development. Dose: For children 4 years and older. Individual needs may vary. Start with half a teaspoon (1 g) daily and gradually increase to two teaspoons (3.6 g) per day as needed. To shore up kids’ diets during back-to-school time, look for a multi designed specifically for children. 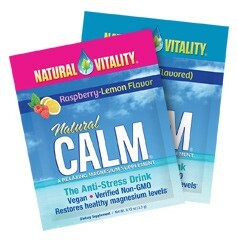 Natural Vitality’s Kids Natural Calm Multi is unique in that it contains daily doses of magnesium, calcium, omega-3s, other vitamins and minerals and 24 organic fruits and veggies. It’s in a liquid form for easy assimilation and can be taken by itself or mixed with juice. This supplement is critical for building strong bones and helps bolster immunity to dodge colds and flus. If your kids spend most of their time indoors, and especially during the winter, give them extra vitamin D.
Dose: 1,000–2,000 IU daily, with the higher dose for older, physically bigger kids. Omega-3s are the ultimate brain food. Look for a kids’ product that contains docosahexaenoic acid (DHA) and eicosapentaenoic acid (EPA); but given a choice, DHA is more important for kids’ brain development. Learning disorders and behavior problems are often linked to low levels of essential fatty acids, so EFA supplementation is critical. Dose: 250 mg DHA and 180 mg EPA for children over age 4; 500 mg DHA and 365 mg EPA for teens.